From sun-filled sojourns to log fire retreats, Belinda Jackson reveals the hottest last-minute winter holidays. called Sven? Or by migrating north in a quest for eternal sunshine? these 20 do-it-now bargains, subject to availability. WHERE Petitenget, the hip strip of Seminyak, Bali. with cleansing organic menus by Pete Evans, from $1795 (saltretreats.com). 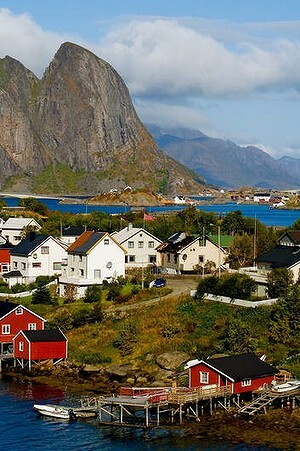 WHEN TO GO The seven-day getaways run weekly until the end of November, but with 30 degrees in July: why wait? GOOD FOR Toxic wage slaves and the vitamin D deficient. STRIP DOWN For a daily massage to detox your body. WHERE The Yasawa Islands, eastern Fiji. and Sacred islands, from $1676 a person (captaincook.com.fj). WHEN TO GO July and August. GOOD FOR Explorers who enjoy five-star comfort. STRIP DOWN Pack your diver’s card and the sunscreen for the back of the knees (the classic snorkeller’s plight). WHERE Papeete, the capital of the country that invented the overwater bungalow, 10 hours via New Zealand. temps of 28 degrees and the FIFA Beach Soccer World Cup. GOOD FOR Francophiles needing winter sun. STRIP DOWN Sarongs and sun hats: there is no need for more. WHEN TO GO Phuket’s rain comes later than other regions, so winter’s just fine. WHERE The island of Oahu, from Waikiki and beyond. Diamond Head Crater hike or bodysurfing at Sandy Beach (creativeholidays.com). WHEN TO GO July sees festivals for ukulele music, hula and of course Independence Day on July 4. GOOD FOR Hawaii old hands seeking new experiences. STRIP DOWN Temperatures don’t vary much in Hawaii – July to September sees 31 degrees tops. 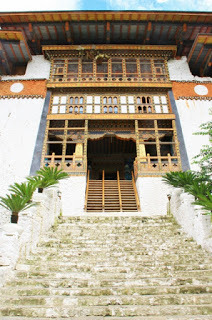 WHERE From Mandalay to Bagan in central Myanmar, the must-visit country for 2013. WHEN TO GO Mandalay remains hot and dry, with temperatures in the mid-30s, while the beach resorts empty as the rainy season kicks in. GOOD FOR Temple tragics and pedal pushers. STRIP DOWN Go tight ‘n’ bright in gear that covers you up while keeping cool: expect to sweat. WHERE Port Vila, Vanuatu, a three-hour flight from Sydney. self-catering accommodation from $784 a person, July 15-September 20 (poppys.com.vu). WHEN TO GO The cold, dry season runs May to October, where temperatures in the capital, Port Vila, hover around a delightful 24 degrees. GOOD FOR Families wanting the beach at their doorstep (couples, there’s an adults-only pool, too). STRIP DOWN Take a traditional outrigger canoe onto the lagoon. WHERE Borneo and Kuala Lumpur. WHEN TO GO Hit the sales, with the mega-sale carnival in July. GOOD FOR Shoppers and floppers. STRIP DOWN July in Malaysia is blissfully dry, with tops of 28 degrees in Borneo. WHERE An hour’s flight north from Sydney. AFL’s Brisbane Lions at the Gabba or the Broncos at Suncorp Stadium. The new Punthill Brisbane serviced apartments start from $169 a night (punthill.com.au). WHEN TO GO July has perfect weather for riverside walks or a boat trip on the CityCat. GOOD FOR Admirers of indigenous art: QAGOMA’s new contemporary indigenous art exhibition runs until October 7 (qagoma.qld.gov.au). RUG UP Or strip down? Go a bit of both, with pleasant 20 degrees tops. WHERE Palm Cove, 25 minutes north of Cairns. WHEN TO GO There’s year-round swimming. Added bonus: July and August are also jellyfish free. GOOD FOR Sun lovers who don’t want to pay for an international airfare. STRIP DOWN Bikini, hat, sun cream: hey, it’s 25 degrees in winter! WHERE Queenstown and Lake Wanaka. WHEN TO GO Pundits say later in the season is better for a guarantee of top conditions, but Mother Nature is a hardened gambler. GOOD FOR Ski bunnies, world-class snow athletes and those who like to watch. RUG UP Time to flash your new-season snow gear, beautiful people. WHERE Lake Jindabyne in the Snowy Mountains, five hours’ drive south of Sydney. can stay two nights from $390 (moonbahhut.com). 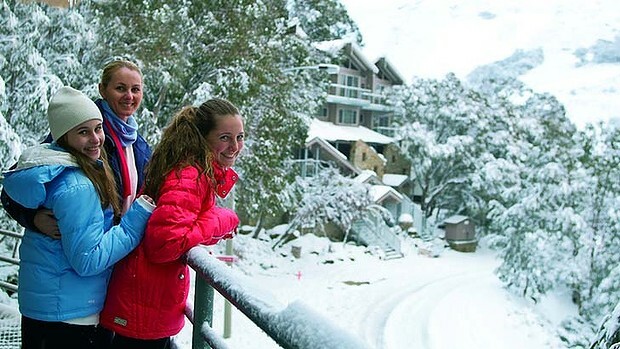 WHEN TO GO Now, for snowshoeing, bushwalking and big log fires. GOOD FOR Fly fishers, snow babies and The Man from Snowy River fans (snowymountains.com.au). RUG UP Forget thermals, warm up with a Wildbrumby schnapps at Thredbo Valley Distillery. WHERE Sutton Forest, 90 minutes’ drive from Sydney, past Bowral. Christmas-tastic from $335 a night (peppers.com.au). WHEN TO GO The whole month of July sees the highlands go completely Christmas-crazy. GOOD FOR Mistletoe freaks and cash-strapped Euro-aficionados. RUG UP Break out the reindeer knits and Santa hats: temps plummet to an 11 degrees average in July. WHERE The Flinders Ranges National Park, five hours north of Adelaide. WHEN TO GO Winter is perfect walking weather. GOOD FOR Painters and photographers and those keen to spot a rare yellow-footed rock wallaby. RUG UP Pack your flannelette pyjamas for the frosty mornings when you’re climbing out of the swag. WHERE The Yarra Valley, an hour east of Melbourne. WHEN TO GO Winter is top ballooning weather. GOOD FOR Walkers on a post-Devonshire tea wander through Sassafras’ Sherbrooke Forest. RUG UP Be sure to layer up for early morning ballooning: a worthy but chilly experience. WHERE The high country ski resorts of Falls Creek and Hotham. person for three nights (mthothamaccommodation.com.au) while the new QT Falls Creek costs from $429 a night (qtfallscreek.com.au). Check out the new two-resort Snow Pass (snowpass.com.au). June 15-21, 2013, and September 7-13, 2013. GOOD FOR Snowman makers, tobogganists and dog sledders (as well as skiers and boarders). RUG UP Beanie, long johns, muffler, fleece, thick socks … we’re talking single-digit temps. WHERE St Kilda is Melbourne’s beachside and home to Luna Park. 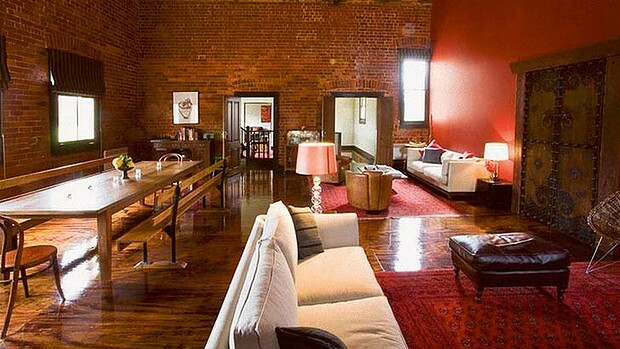 boutique dog-friendly stays across inner-city Melbourne start from $240. WHEN TO GO Now’s the time to experience the cosy side to Melbourne. GOOD FOR Pet lovers who don’t want to leave a family member at home. RUG UP Pack the parka and power-walk the pier with the pups. WHERE Two hours off the NSW coast. Challenge week runs October 14-18 ($1715 a person) (pinetrees.com.au). GOOD FOR Environmental explorers and back-country adventurers. STRIP DOWN Pack hiking boots and binoculars for a very nice 22 degrees top. WHERE Heading down south to Hobart. wine and visit the museum, from $660 a person (mona.net.au/create-your-stay). WHEN TO GO The exhibition runs until April 2014. GOOD FOR Lovers of dark arts. RUG UP She’s a bit nippy: pack windproof and rainproof jackets and break out the pom-pom beanies. WHERE Swansea, 1½ hours from Hobart or Launceston airports. 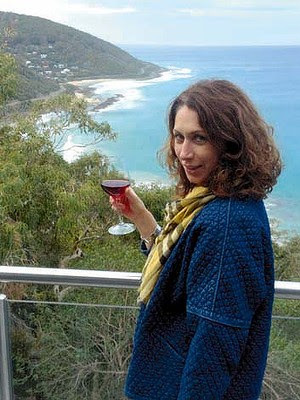 hectares, overlooks Maria Island and costs from $500 a night. GOOD FOR Painters, bushwalkers and pinot lovers everywhere. RUG UP You don’t need a lot for the tub, but pack hiking boots and binoculars for everything else. Melbourne fashionista Lisa Gorman takes to the Great Ocean Road. knowledge came to the fore. to seeing family in Warrnambool. family dined at Wye Beach Hotel. hour north of Wye River. pier. But there was no swimming in the chilly waters of Bass Strait. but after Apollo Bay it gets really wild,” Lisa says. she’ll be back soon for another taste of her childhood region. 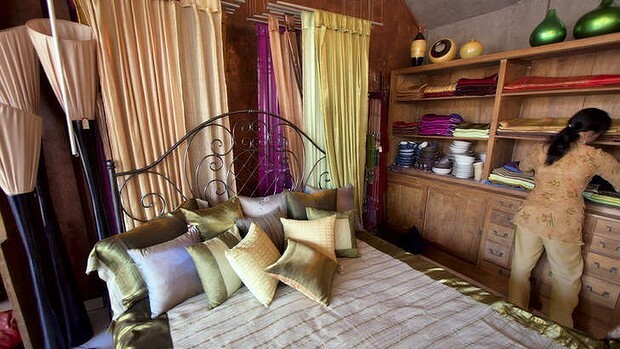 other at a chic eco-lodge. well-rounded concept, and they’re a multitasking gang,” Lisa says. umbrella of the 12 Apostles Food Artisans (visit12apostles.com.au), to sample everything from malt whisky to chocolates to berries and highland beef pies. the walks. It’s about nature, and it’s about the ocean,” says Lisa. sunglasses before you walk out onto the balcony,” says Lisa. Islands, is 10-minutes west of Peterborough. supported by a professional sailing team. sailing experience is required and some cabins are wheelchair friendly. 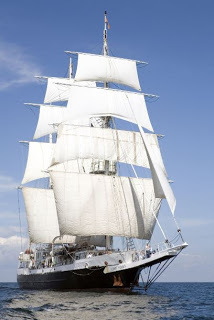 8, which includes a cross-Tasman Tall Ships race. 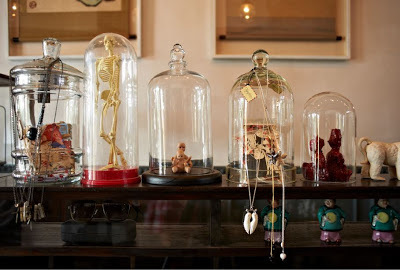 Seminyak’s shopping is a treasure trove of fabulousness, as Belinda Jackson discovers. belt to show the rest of the gang. riding the pure, glistening wave of the retail high. Rodeo Drive, it’s not Milan: it’s Bali. Seminyak, to be precise. and most boutiques can organise it for you overnight. standout statement pieces (100 Jl Laksmana). intimo (12 Jl Raya Seminyak). Seminyak market opposite Seminyak square. contemporary Indonesian artists (36 Jl Raya Seminyak). Kunti, not far from the intersection of Laksmana and Raya Seminyak. Think of it as “the Paris end of Seminyak”. avoid changing-room angst (6 Jl Kunti). 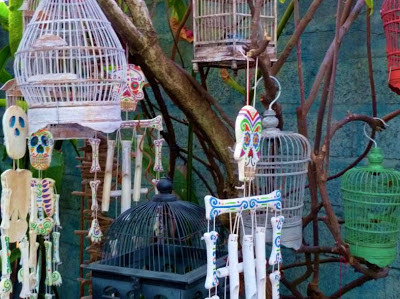 paradise in Bali, and not just lovers of the omnipresent Buddha statues. good coffee or nearby Petitenget for a luxe lunch and cocktail option. Bali’s street kids, under a not-for-profit charity (Jl Raya Seminyak). list for knockout artworks (C002 Jl Kayu Cendana). T-shirts) to celebrate a job well done. Belinda Jackson was a guest of Space Villas. Villas, No. 8 Jl Drupadi, Seminyak. 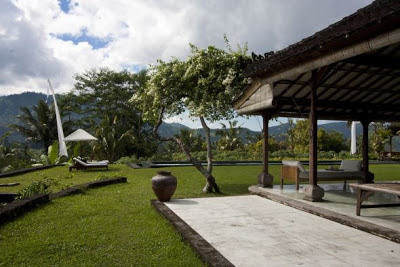 +62 361 731100, spaceatbali.com. Getting there Virgin Australia (virginaustralia.com), Jetstar (jetstar.com.au) and Garuda Indonesia (garuda-indonesia.com) fly Sydney to Denpasar direct. Whipping up suja for breakfast on the farm. They breed ’em tough in the mountains, so when the mountains in question are the Himalayas, you can expect a level of resilience not found in us soft seaside dwellers. While the temps may be freezing on the mountains, the Bhutanese like it hot in their bowls. There’s no better example than national dish, ema datse. 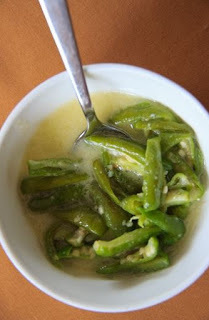 If you need to polish your Bhutanese, ema = chilli, datse = white cheese. “You don’t come to Bhutan for the cuisine,” warns an old hand before I fly over. “Just name a vegetable and add datse,” jokes a local, reinforcing the theme: and thus a restaurant menu may well read: ema datse, kewa datse (potatoes & cheese) and shamu datse (mushrooms & cheese). Take a look at the picture of ema datse, below. The green things are chillis, with the seeds left in. According to Tshering, my guide, these are the mild ones. The real hotties are tiny and bright green. Often, they’re served in a small, fresh salad, esay, that comprises chopped green chillis, red onion, ginger and coriander. The chilli mix is scattered over the chilli & cheese, to add flavour. ema datse: chilli and cheese ‘stew’. That’s not to say the Bhutanese are the world’s top chilli monsters: Tshering tells me of a Mexican group he led, who were delighted to discover the country’s crazy chilli culture. “They kept asking for more, and hotter,” he says. In the end, they broke him: they out-chilli’d him. He had to give up. Kids start their path down the road to hellish fire when they’re about three or four. They start with the ‘mild’ large green chillis before working up to the little green devils, which the adults eat without working up a sweat. No wonder the Bhutanese are generally trim: they spend all their time walking mountain roads, then give the metabolism a turbo-boost with chilli served at at least two of the three main meals. miga‘ (‘I don’t like food with chillies’ – hello, have these travellers no self-respect? It’s like going to Iceland and saying you don’t like the cold). 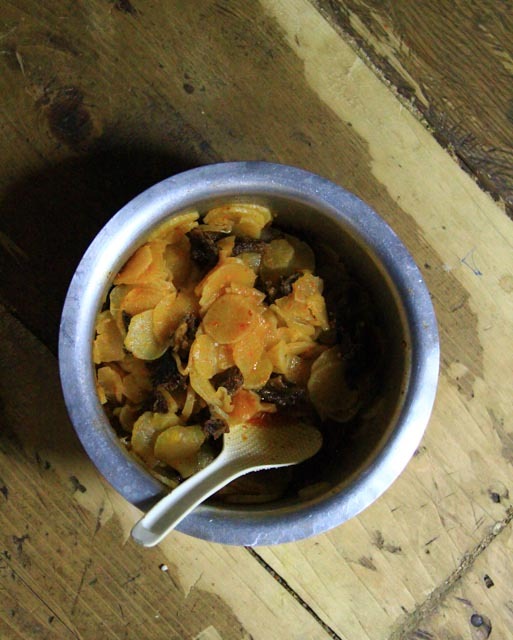 turnip stew. Chewy, but tasty. In contrast, one morning I breakfasted with some farmers, and was reassured to find they, too, eat cereal for brekky. Rice is roasted and popped to become dzow, sort of like Rice Bubbles. 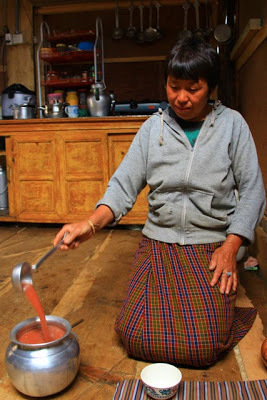 But instead of plain cow’s milk, it’s served with suja, tea made with butter and salt, which is frothed vigorously in a pot with a bamboo stick and quite red in colour (see Namgay making it, in the first photo). Not so much like Rice Bubbles. They’re also big on local red rice, a short-grained, nutty rice, and buckwheat pancakes are a common carb as well. 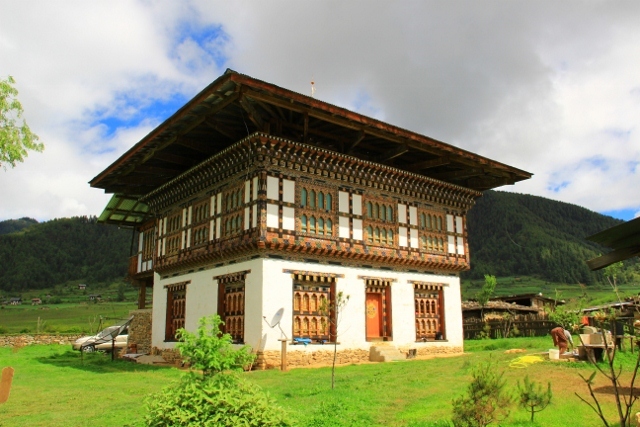 Bhutan has just finished a no-meat month which sees the country’s butchers shut shop and no meat on the menu, though tourist hotels are usually exempt (and the Bhutanese fill their freezers full of meat in advance, so I’m not quite sure of the benefits). And, interestingly for the observant amongst you who were wondering about meat-eating Buddhists, they do eat meat, but they don’t kill it: it’s all killed in India and transported in. Apparently you lose less karma by just eating meat than you do by killing it as well. Take from that what you will. itself, though you’ll also find simply delicious momos, Tibet’s little steamed dumplings of minced beef or shredded vegetables, which I last ate in Dharamsala, India, where the Dalai Lama lives in exile out of Chinese-occupied Tibet. 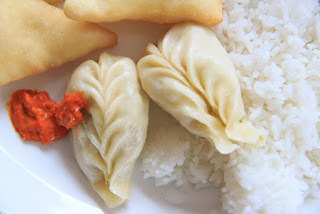 These ones in the photo were made in a momo specialty restaurant in Thimphu, and I also tried a larger version, which was really a knot of dough steamed and served with a blob of minced chilli and a bowl of kewa datse. A note: despite the walking, the high-altitude and the copious amount of chillis I ate, I have not come back waif-like. Go on a Balinese seafood adventure, drink it in the Napa Valley or hit St Kilda, flashpacker style in this week’s international and domestic deals. always wine tasting at the nearby cellar doors if you want to grow up. $209 a room. 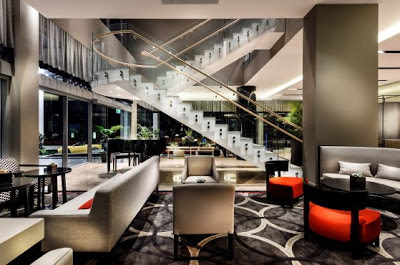 (02) 4998 2000, mercurehuntervalley.com.au. $245 a night (studio). 1800 099 465, perth.frasershospitality.com. Springs. Book by June 28 for travel until June30 and save 25per cent. Costs $776 a person. 1300 018 871, intrepidtravel .com/australia-sale. two-berth campervan for 10 days, travellers-autobarn.com.au. costs from $320. +63 (2) 238 8888, dusit.com. September 30. Costs from $510, three nights. +62 363 410 11, alilahotels.com/manggis. pay for only three until August 30. Costs from $1077, virtuoso.com.au. a person. 1800 221 712, bentours.com.au. Ella Hooper: singer, songwriter, musician. “I seem to do more cultural stuff in the country. veg out, listen to music. I get a lot of writing done. each month. That’s market day. about seeing who’s in town,” Ella says. by the couple who own it, both of whom have worked in film and theatre. and Swanpool’s historic arthouse cinema are also must-visits, Ella says. weir, about a 30-minute drive south of Violet Town, is a favourite. who fell in the water one night and was never seen again. Ella stayed at Ain Garth (”our home”), a self-contained cottage in Violet Town. (www.violettown.org.au). to stay within walking distance of Violet Town’s shops. artisan producers in north-eastern Victoria. vineyards is Tallis Wines, in Dookie (www.talliswine.com.au), between Benalla and Shepparton. combinations, especially when matched with a tasting plate of beers. 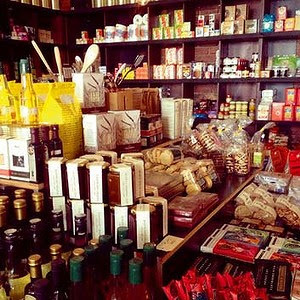 the store’s pantry, too. “You can buy jams, preserves and pickles. Road and Galls Gap Road meet. 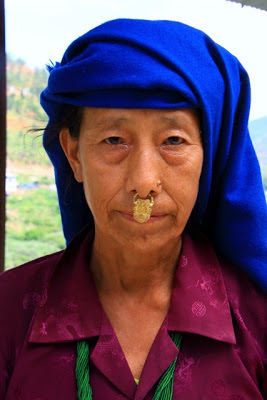 A Nepali-Bhutanese vegetable market trader. Plummeting chili prices upsets Tsirang farmers: chillis (a national staple) have fallen from Nu 150 to as little as Nu 15. The Bhutanese currency is the Ngultru, which is tied to the Indian dollar. Nu 53 = AUD1. Alcohol liver disease top killer (140 people died from it in the past year, making it the top killer). Full out to file in nominations: candidates for the upcoming national elections have till today to complete their registrations. And the Film Association of Bhutan archery team defeated Dhen Truk 11 in two straight sets in the Silver Jubilee archery tournament. According to the daily zakar (kind of like horoscope), tomorrow is a good day to conduct daily rituals only. It’s also a bad day to start military training, to hand and take over office, to shift house, start new business, marry or sell land. daughter, her two-year-old daughter and seven-year-old niece. 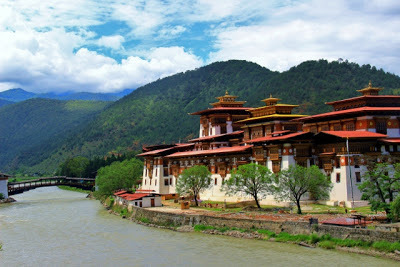 a large circle that includes me, my guide Tshering and driver Tensing. 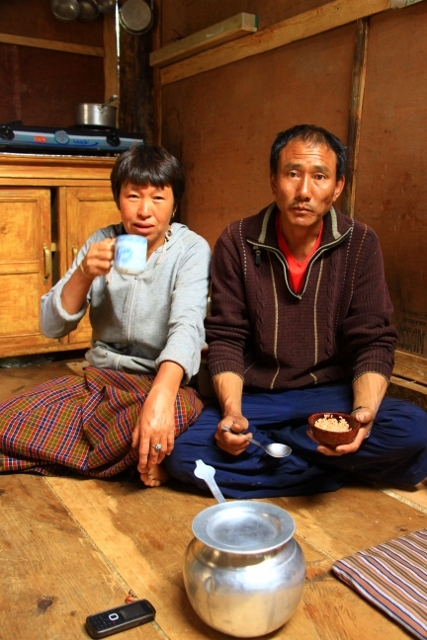 the 79-year-old grandfather, Tshewangla, adopts for his light dinner. Namgay Pem and her husband Phub Gaytshey. international award for its role in educating people about the dangers of HIV. with a deep altar which Phub attends carefully each morning. is no word for ‘goodbye’ in Dzongkha, only ‘see you again’.